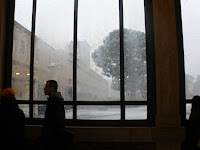 Last Friday, students in Professor Adrian Hoch’s Michelangelo course braved the unusually winter weather — SNOW in Rome! — to visit some of Michelangelo’s most famous works of art. 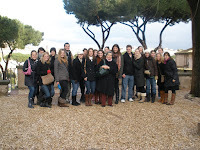 Students started out at the Vatican Museums and the Sistine Chapel, and then made their way around tthe city to see the Campidoglio, the famous Moses at San Pietro in Vincoli, the Porta Pia, and numerous other works designed by the Renaissance master. Students may not have realized just how lucky they were to see snow falling in Rome… it was the first snowfall in the Holy City since 1986!